On 10th January 1964, a young Geoff Grayton made his way up the tower stairs of St Mary the Virgin, Saffron Walden, on his way to his first ringing lesson. He found a welcoming band of ringers, and an activity which he felt he could enjoy and become reasonably competent at. 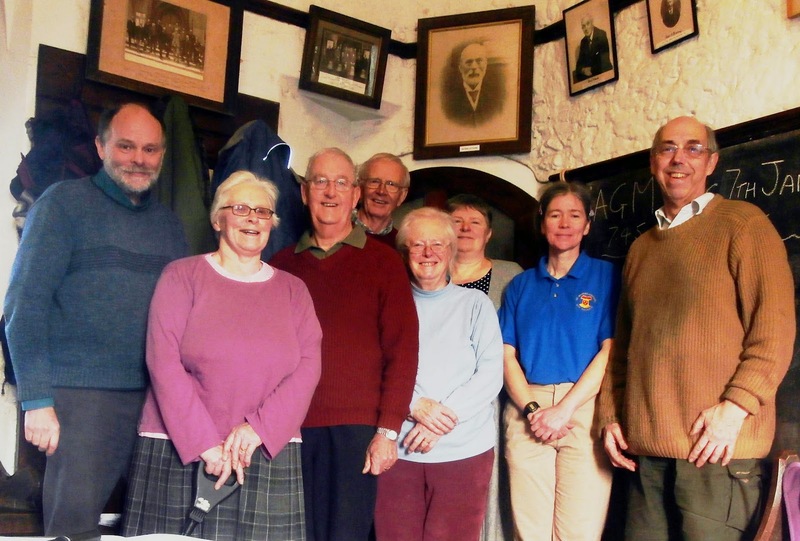 On 10th January 2014, Geoff climbed the tower stairs at Saffron Walden again – this time accompanied by a group of ringers with whom he rings regularly, all intending to help Geoff celebrate his anniversary. We were welcomed by Roger Collins, Master of the North West District of Essex, which includes Saffron Walden, who started to ring a couple of years after Geoff and has rung with him at intervals ever since. Geoff rang his first quarter peal at Saffron Walden in July 1967, ringing the 5th to Plain Bob Minor with Roger Collins on the treble, and moved to Haverhill in the early 1970’s where he rang his first peal, of four minor methods, in June 1975. He subsequently moved to Cherry Hinton and rang at towers in the Ely Diocese, with peals at Meldreth and Cherry Hinton. Geoff now lives just north of Cambridge, and rings regularly at Histon, Over and Swaffham Bulbeck, among others. Although Saffron Walden is not far away, it was a new tower to two of Friday’s ringers, and only a second visit for two more. We started with some general ringing - Grandsire Triples, Plain Bob Major and Stedman Triples, to familiarise ourselves with the bells and to establish that we had a band who could attempt a quarter of Plain Bob Major. After the first touch, Geoff was presented with a card and certificate to general applause. With Geoff turning in the tenor, and Alan Winter conducting from the treble, we started on the quarter peal, always being aware that we had to do justice to these excellent bells, and to take account of the prominent position of the church in Saffron Walden. Alan warned us that the composition was a little dangerous as the part ends were close to rounds, but we managed to avoid those particular errors and completed the quarter in fine style. Then it only remained to lower the bells, take a photo of the quarter peal band, and adjourn to the King’s Arms for refreshments and more celebration. Saffron Walden, Essex. (St Mary the Virgin) 10 Jan, 1344 Plain Bob Major (Composed E M Atkins): Alan Winter (C) 1, Marion Robinson 2, Geoffrey Reed 3, Gerard Chadwick 4, Janet Garnett 5, June Mackay 6, Barbara Le Gallez 7, Geoff Grayton 8. To celebrate the completion of 50 years of ringing by Geoff Grayton, who started to ring in this tower, 10/01/1964. The band wish to associate Sarah Farley and Roger Collins with this quarter.